Imagine your piano reproducing the classic sounds of Rachmaninoff, Rubinstein or any of your personal favorites. PianoDisc is a unique electronic system that can turn almost any upright or grand piano into a “player” piano! They can create a whole new home entertainment center. 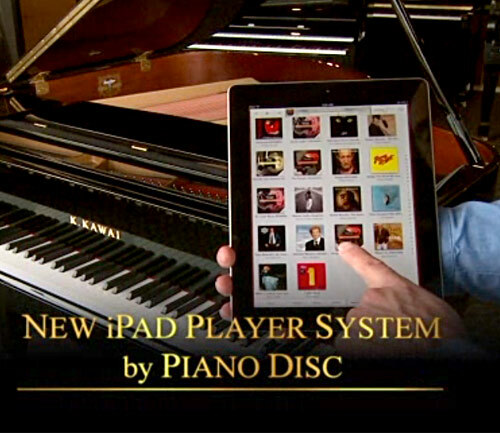 PianoDisc products include basic player systems and advanced CD systems with amazing capabilities. Now PianoDisc features the revolutionary Silent Drive system, which allows your piano to play with full expression, even at whisper soft levels. New is the iQ Intelligent Player system. iQ’s electronics are hidden within the piano. The system can be controlled by any number of devices—the user can choose his own—including technologically advanced music delivery devices, like MP3 players, the iPod®, DVD players, webpads, laptops and desktops. iQ also interfaces with PianoDisc’s Sync-A-Vision system, which adds an exciting visual element to the player piano experience. Call us to inquire on the possibilities of this unique entertainment system!